Today, Secretary of State Kim Wyman joined the Federal Trade Commission (FTC) and state partners in announcing Operation Donate with Honor, a nationwide law enforcement and education initiative to stop veteran-related charity fraud. Charity regulators from 70 offices, including every state, Washington D.C., Guam, American Samoa, and Puerto Rico, joined the FTC in this initiative, announcing more than 100 law enforcement actions targeting veteran-related charities and fundraisers. This unprecedented cooperative effort signals that charity scammers who prey on Americans’ patriotism and generosity should beware…law enforcement is watching – and taking action. When you donate to help veterans, you want your donation to go to a charity that really helps them and their families. Doing a little bit of research and asking questions will help that happen. Many charities do a great job supporting our nation’s veterans with education, training, counseling, financial assistance, and more. But a few organizations take advantage of people’s generosity. They use images and tell compelling stories that appeal to our hearts and patriotism, but they lie about what they do and how they spend donors’ money. Often, they use names that sound similar to those of well-known charities or that include words like veteran, foundation, operation, hero, wounded, disabled, or homeless. 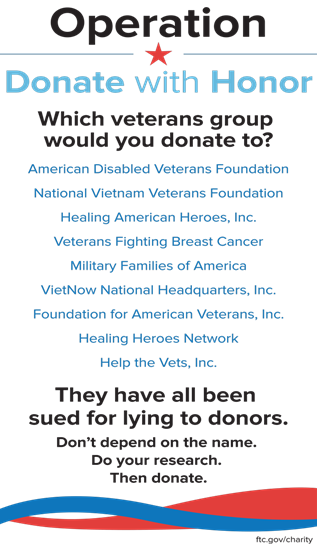 Just because those words are in the organization’s name doesn’t mean it actually helps veterans. You want to make your donation counts. Read these tips to help you GIVE SMART. See if the charity is registered with the Office of the Secretary of State. Most states require charities to register before soliciting. Check out reports and ratings through responsible organizations like BBB Wise Giving Alliance, or charity watchdogs like Charity Navigator, CharityWatch, and GuideStar. If someone asks you to send them cash, wire money, donate by gift card, or leave money under your front door mat for pick-up, don’t do it. That’s how scammers often ask you to pay. It’s safer to pay by credit card or check. In Washington State, except in certain circumstances, charities and fundraisers soliciting contributions may not collect or attempt to collect contributions in person or by courier. They thank you for a donation you don’t remember making. Scammers do that to trick you into thinking you actually made a pledge, and guilt you into sending money. Report veteran charity scams to the Washington State Attorney General’s, Consumer Protection Division at 1-800-551-4636 or visit the Attorney General's website and file a formal complaint online at https://fortress.wa.gov/atg/formhandler/ago/ComplaintForm.aspx. You may also contact the Federal Trade Commission at FTC.gov/complaint to report charity scams. Give as much information as you can in your report including, the name of the charity, the name of the fundraiser who contacted you, their phone number, report including, the name of the charity, the name of the fundraiser who contacted you, their phone number, website, address, and any other details they gave about the charity. For more tips on Giving Smart and how to research charities, go to www.sos.wa.gov/charities/. Additional tips are also available from the Federal Trade Commission at www.FTC.gov/Charity . There are many great charities serving veterans in need that rely on individual contributions. You don’t want to donate to a fake charity; you want your donations to count.